The Music Department of Texas A&M-Commerce moved into this new building when it was built in 2010. 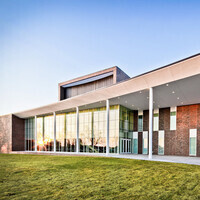 The building features state-of-the-art performance, rehearsal and instruction facilities, including a concert hall seating 600, a recital hall seating 75, five rehearsal halls, classrooms, piano and electronic music labs, studios and practice rooms. The university singers, choral women's and men's chorus, and the chamber singers were all well executed in their musical performance. I enjoyed it very much! The symphonic band never disappoints.